CEOM learned with dismay the arrest for "treason" and Turkish Medical Associations leaders (TTB) on January 30th. CEOM fully supports our Turkish colleagues in their public statement that war is a public health problem according to their ethical and humanitarian duties. On the basis of a survey of the situations existing in all European countries, the organizations participating in the CEOM adopted a statement condemning violence against doctors and health professionals. CEOM is urging governments and all concerned parties to be aware of the issue and to take all necessary measures to ensure access to quality care for all patients by protecting the freedom and safety of medical personnel and healthcare facilities. 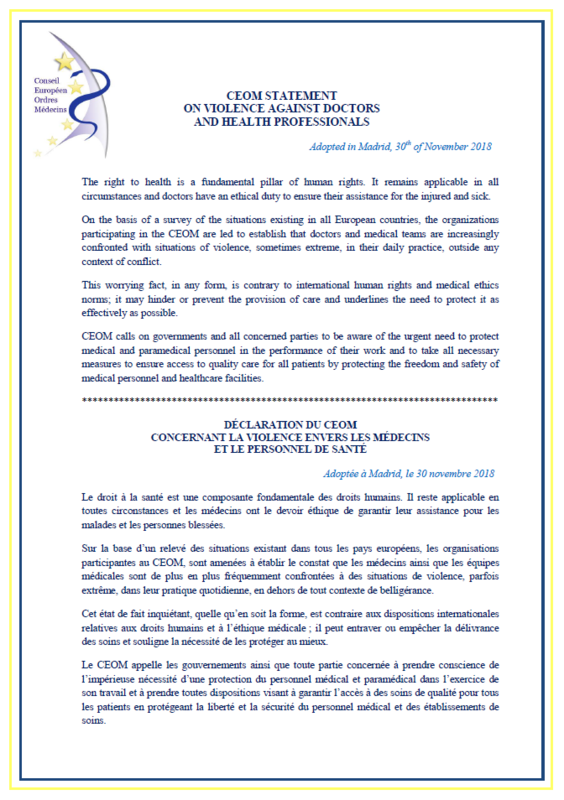 CEOM strongly denounces these attacks on freedom of expression, right to health and access to healthcare. Read here the full press release of the World Medical Association. Registration is live and places still available for the Healthcare Professional Crossing Borders (HPCB) – Promoting patient safety across borders conference, to be held in London on Friday 28 October 2016. The conference will focus on professional mobility and patient safety, looking at the implementation of the recognition of professional qualifications Directive, with a focus on the European professional card and alert mechanism. Keynote speakers include Vicky Ford MEP and the European Commission DG GROW and DG SANCO. Two panels will discuss the implementation of the European professional card and aler mechanism, and ensuring patient safety through CPD and revalidation. HPCB are encouraging healthcare competent authorities and regulators in the European Economic Area (EEA) to register now! If you have any questions please do not hesitate to get in touch with the HPCB secretariat at HPCB@gmc-uk.org. POLITICO and Le Temps invite you to the “Annual Health Care Summit: Achieving Effective, Innovative and Sustainable Health Care Systems” taking place on October 11th in Geneva. Presented by Ferring, Merck, Roche, AbbVie, Dentons and Weber Shandwick, the program will probe the policy priorities of health care in Europe, including e-Health and big data. · How do we integrate data into health care decision making? · What policies will make safe and effective drugs accessible to more patients? · Will public-private partnerships save the day for effective health care delivery? · How do we empower patients to make the best decisions for their health? The event will gather key speakers including Richard Bergström, Director General, European Federation of Pharmaceutical Industries and Associations; Agnès Buzyn, President, French National Authority for Health; Josep Figueras, Director, European Observatory on Health Systems and Policies; Keiji Fukuda, Special Representative for Antimicrobial Resistance, World Health Organization; Miguel Gonzalez-Sancho Bodero, Head of Unit for eHealth, Well-Being & Aging, DG CNECT, European Commission; Peggy Maguire, Director General, European Institute of Women's Health, Board Member and Former President, European Public Health Alliance; Peter Salama, Executive Director, Health Emergencies Program, Word Heath Organization. Discover all the speakers and the latest agenda here and register here! On June 9, 2016, in Rome, the Latin-Iberoamerican medical institutions delivered to Pope Francis the Identity Card and Principles of the Medical Profession. Latin-Iberoamerican doctors recall their "unconditional commitment to serve without discrimination of any kind the health needs of patients taking their social determinants into account, with humanism and the most appropriate professional skills, at the service of health, life, and human dignity". On April 14th, 2016, the Czech Medical Chamber celebrated its 25th anniversary in Prague. On this occasion, Czech Medical Chamber President Dr. Milan Kubek recalled the importance of professional autonomy and the independence of doctors. Dr. Otmar Kloiber, World Medical Association Secretary General, stated that the 25 years of the Czech Medical Chamber were the living proof of the democratic stability in Czech Republic. More information available on the Czech Medical Chamber website. On May 27th, the European Commission published a public consultation on the regulation of professions. The consultation invites professionals and consumers to share their views on the proportionality of regulation in Member States’ National Action Plans set in the framework of mutual evaluation of regulated professions. The consultation is accessible on the European Commission website until August 19, 2016. On May 18th, the European Commission published its country recommendations, offering economic guidelines to the EU Member States for the next 12 to 18 months. The European Commission focuses on strengthening the recovery of Member States’ economies by boosting investment, implementing structural reforms and pursuing fiscal responsibility. Marianne Thyssen, Commissioner for Employment, Social Affairs, Skills and Labor Mobility stated that “Only by ensuring that social considerations are better integrated in all EU policy areas we will truly achieve a Social Europe”. Country recommendations are accessible on the European Commission website. The May issue of the Joint Action Health Workforce Planning and Forecasting newsletter focuses on the Closure event and plenary assembly held on May 3rd and 4th in Mons, Belgium. The newsletter includes a state of play of the Joint Action Working Packages and last actions of the programme, which ends on June 2016. More information available on the Joint Action website. On May 25, the Standing Committee of European Doctors (CPME) adopted a Statement on cooperation in the European Union, in which CPME recalls its commitment to the benefits of cooperation in the EU, both at the institutional and governmental level, as well as between National Medical Associations. Furthermore, CPME highlights that the European Union protects fundamental rights of the EU citizens and provides a legal framework for the mobility of doctors and patients. CPME therefore appeals to doctors, citizens and governments to consider the benefits of cooperation in the EU and to remain committed to the European project. More information on the CPME website. A joint conference was organized on December 18, 2015, in Luxembourg by the European Medical Organizations (EMOs) on Continuous and Professional Development. On this occasion, the European Medical Organizations adopted a consensus Statement following the revised Directive 2013/55/EU amending Directive 2005/36/EC on the recognition of professional qualifications and Regulation EU No 1024/2012 on administrative cooperation through the Internal Market Information System (‘the IMI Regulation’). The report of the conference is available by clicking on this link. The Joint Action Closure event, "Towards sustainable health workforce for Europe", along with the Plenary Assembly and Stakeholder Forum will be held in Mons, Belgium, on 3-4 May, 2016. The Closure event will focus on the presentation of the Joint Action deliverables that have been produced since the last Plenary Assembly held in Madrid on March 2015. The event will also focus on the sustainability and next steps as well as report on the evaluation of the Joint Action. More information and programme of the closure event on the Joint Action website. The 2016 Healthcare Professionals Crossing Borders (HPCB) Conference will take place on Friday 28 October in London. It will be jointly hosted by the UK Nursing and Midwifery Council and the General Medical Council. The conference will bring together European healthcare professional regulators, professional bodies, national government representatives and European Commission stakeholders. The agenda will focus on the lessons learnt from the implementation of the recognition of professional qualifications Directive, with a special focus on the European professional card and alert mechanism. Information will be published on the HPCB website and upcoming editions of the HPCB update. All the information about the venue of the meeting and how to get to Coimbra from Lisbon and Porto are available on the website. All meeting documents will be available in the Meetings section of the CEOM website. The meeting registration and hotel reservation must be done by April 17 at the latest. The March 2016 edition of the HPCB Crossing Borders Update is now available. This update includes details on the entry into force of the 2013/55/EU Directive on the recognition of professional qualifications and the launch of the European Professional Card (EPC). The newsletter also features the latest CEOM updates and a summary of the third Joint Action Health Workforce Planning and Forecasting Conference. More information on the HPCB website. The government of Ecuador launched in 2015 the “Healthy Ecuador, Let’s Go” initiative, a program that invites foreign or Ecuadorian doctors living abroad to contribute to the knowledge transfer to Ecuador. The program aims at strengthening medical care in hospitals and healthcare centers in the country. More information on the program is available in the “Jobs and Practice” section. The European Council of Medical Orders now has a Wikipedia webpage in French. Its purpose is to inform the general public on CEOM's activities and to make the adopted documents and statements more visible. On December 4, 2015, the Health and Environment Alliance (HEAL), the French Medical Council (CNOM), the World Medical Association (WMA) and the International Federation of Medical Students’ Association (IFMSA) organized in the CNOM headquarters in Paris the event “Health professionnals in action for Healthy Energy and Climate”. Public health advocates from all around the world had the opportunity to share their success stories on health protection and climate change and air pollution mitigation. The press release of the event is available in English here and all the event documents are available on the HEAL website. Watch the video of the event here. In addition, the French Medical Council has recently issued a webzine on health and climate change promoting the positive effects on health of the reduction of greenhouse gas emissions. On November 10-11, in Lisbon, the Ordem dos Médicos de Portugal and the Consejo General de Médicos de España held their annual bilateral meeting. On this occasion the Portuguese and Spanish Orders adopted the Declaration of Lisbon which sums up the debates that took place during the meeting. The Declaration of Lisbon is available in Portuguese, Spanish and English. 10 medical Orders attended the meeting: Belgium, Cyprus, France, Greece, Italy, Luxembourg, Portugal, Romania, Spain, and Switzerland. Four guest institutions also attended the meeting: The Standing Committee of European Doctors (CPME), the European Federation of Salaried Doctors (FEMS), the Institute of Global Health of the University of Geneva, and the Italian Institute for Health, Migration and Poverty (INMP). A statement on providing health support to street children, one on mobile health, another one on physicians well-being, a statement on transgender people, aiming at enabling doctors to increase their knowledge on specific health issues, and an emergency resolution urging governments and international organizations to provide health care to refugees. Finally, delegates demanded an independent enquiry into the bombing on the Médecins Sans Frontières hospital in Kunduz, Afghanistan. More information on the WMA Website. On September 18th, on the occasion of the 30th anniversary of the integration of Spain within the European Union, the Spanish Medical Council organized a European Day of the medical profession in Madrid, in the premises of the Permanent representation of the EU Institutions. Members of the French, Italian, and Portuguese Orders attended the event. The Spanish Medical Council held three roundtables during the day. The first one gave health professionals the opportunity to express their concerns about the trade agreement currently being discussed between the United States and the European Union. The second one focused on cross-border care. The last roundtable allowed participants to summarize the ideas developed during the day. The conclusions of the European Day are available in English, French, Spanish, Portuguese, and Italian. Unión Profesional, an association of 34 Spanish professional orders, published a practical guide to publicize the role of professional orders to the general public. Click here to download it. The European Council of Medical Orders signed the Glasgow Declaration, adopted in October 2014 by Alzheimer Europe. The Declaration calls for the creation of a European Dementia Strategy and national strategies in every European country. The signatories also call upon world leaders to recognize dementia as a public health priority and to develop a global action plan on the issue. The full text of the Declaration is available here. The July edition of the HPCB Crossing Borders Update is now available. This update includes details on the Secondary legislation on EPC and FtP alert mechanism, European Union institutional developments such as MEPs call for improvement of patient safety, CEOM news, and Joint Action Health Workforce update. Health literacy in Europe - Empowering patients : How can technology contribute to improving health literacy? On July 1st, the Science and Technology Options Assessment unit of the European Parliament (STOA) organized a workshop about “Health literacy in Europe – Empowering patients how can technology contribute to improving health literacy?” to learn how new technologies can help patients to become more independent and improve health literacy. According to STOA Chair MEP Paul Rübig (EPP, Austria), “It is critical to guarantee that citizens can make decisions about their own health (…) we have to work also on legislation to protect privacy”. Concluding the workshop, MEP Karin Kadenbach (S&D, Austria) said that “Low health literacy has proved to have a direct impact on the management and chronic conditions, productivity levels, mortality rate and overall healthcare costs”. More information on the European Parliament Website. In an article published in the online journal POLITICO, Health commissioner Vytenis Andriukaitis explains his desire to expand the role of the European Union in health. In fact, the Lisbon Treaty only gives the EU "supporting competence" to Member States. Health policies remain an exclusive competence belonging to Member States. Giving the EU more powers in terms of health policies would imply revision of the EU treaties. In a Joint Declaration, the French Public Health Association, the French Society of Environmental Health, the French Medical Council and their European and International partners - including CEOM - ask negociators to address health in December during the Paris International Climate Conference (COP21).The signatories recall the role of health professionals in providing healthcare for the victims of climate change consequences and ask the French authorities to explicitly include health in the final negociations and commitments of COP21. The full text of the Joint Declaration is available here. The European Council of Medical Orders adopted during its plenary meeting in Luxembourg the CEOM Statement on the use of mobile health (mHealth) in the European Union. It underscores the deontological aspects which have to be considered during the reflection on mobile health. A European legal framework should be provided for all mHealth applications and connected objects (including applications and connected objects related to the way of life and the well-being of people) which do not fall within the scope of the European medical device regulations in order to provide possible restrictions on their marketing based on the risks they would mean for human health and safety. A high level of health and safety protection must be guaranteed to the patient whose medical support (diagnosis, patient's treatment and monitoring) is conducted by mHealth tools that are not medical devices as defined in the European legislation. Public and regulatory authorities (both national and European) implementing policies that promote the use of mHealth devices commit to ensure public health through technical and technological security measures, and informational measures. While providing medical support, the physician uses certified mHealth technologies, when their use is medically justified and motivated by the patient's interests. The patient's rights as a user of mHealth applications to his personal data protection, particularly those related to his health, must be respected by developers, suppliers and sellers so that appropriate safeguards are implemented. Ahead of the Employment, Social Policy, Health and Consumers (EPSCO) Council meeting in Luxembourg on 19 June 2015, three non-governmental organizations called on EU Health Ministers in an open letter to take action on migrants health. The Platform for International Cooperation on Undocumented Migrants, Doctors of the World, and the European Public Health Alliance reminded Member States about their April 2014 agreement on the promotion of access to healthcare for all migrants, as well as the need for "special health services for particularly vulnerable migrant groups". The letter, co-signed by several European associations including CEOM, asks the EU Health Ministers to "challenge EU and national policies on migration which undermine public health objectives, and use the tools available at European level to drive developments towards universal access to healthcare in the Member States of the European Union. Thirteen Orders attended the meeting: Austria, Belgium, Cyprus, France, Greece, Italy, Luxembourg, Portugal, Romania, Slovenia, Spain, Switzerland, United Kingdom. Four guest organisations also attended the meeting: the Standing Committee of European Doctors (CPME), the European Union of Medical Specialists (UEMS), the INPHET Network, and the Finnish Medical Association. 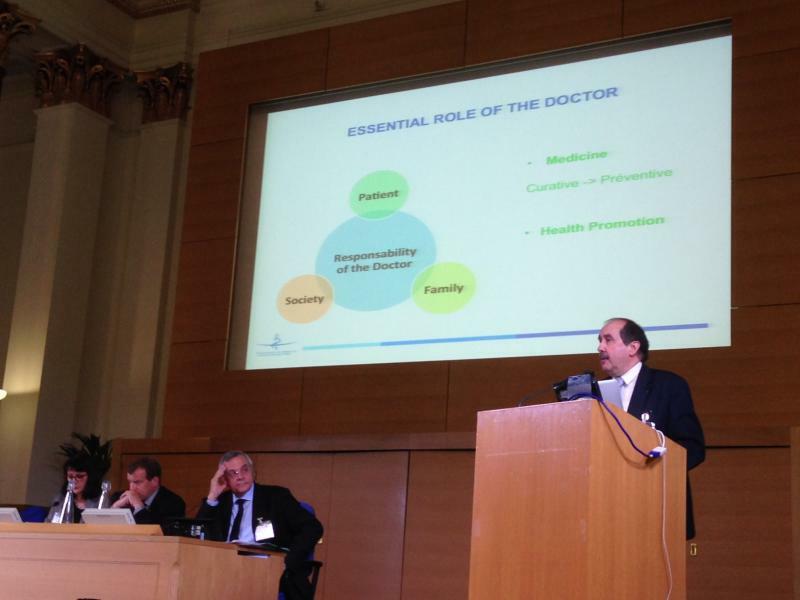 On March 24th, at the British Medical Association Symposium in London, French Medical Council President Patrick Bouet presented CNOM's position on social determinants of health. President of the World Medical Association Dr. Xavier Deau insisted on the need of a global action on the social determinants of health issue. In Oslo, during its 200th Session, the World Medical Association Council adopted an emergency Resolution calling on governments and national member associations to advocate for trade agreements that protect, promote and prioritize public health over commercial interests and ensure wide exclusions to secure services in the public interest, especially those impacting on individual and public health. The full text of the WMA Resolution is available here. On 13th May 2014, Doctors of the World released its 2014 report on access to healthcare for the most vulnerable in a Europe in social crisis with a special focus on pregnant women and children. This report reiterates the need for unconditional access to both antenatal care for pregnant women and to essential childhood vaccinations. This report analyses 29.400 consultations provided in 2013 to 16.881 patients across 25 cities in 8 European countries. An infographic and videos accompanying the report are available here. At the occasion of a conference organised in Granada at the beginning of April on migrant and ethnic minority health, the European Public Health Association (EUPHA) adopted a declaration on access to healthcare for migrants and ethnic minorities, in a context of economic crisis. The Declaration calls on all European governments to take concrete steps to protect the health of these vulnerable groups and to ensure them access to healthcare without discrimination. The Granada Declaration is available here. 14.05.2014. On Thursday 15 May 2014, the European Federation of Salaried Doctors (FEMS) leads an Action Day of European Doctors in order to ensure access to high quality healthcare for all patients in Europe, to promote decent working conditions for European doctors and to fight corruption in the health sector. Dr. Roland KERZMANN, President of the CEOM, attended the Council meeting of the World Medical Association held in Tokyo from April 24th to April 26th, 2014. Discussions mainly focused on clinical trials, health support for street children, criminalisation of healthcare, protection of health workers and air pollution.For more information, please visit the WMA website. At the invitation of the Italian Medical Council (FNOMCeO), the next CEOM plenary meeting will take place in Bari on Friday, 13th June, 2014. For more information, please consult the Agenda section (Access restricted to members only). The April edition of the HPCB Crossing Borders Update is now available. This updates includes details on the European Commission consultation on the European Professional Card, information on the conference of the International Association of Medical Regulatory Authorities (IAMRA) organised in September, news on the EU Health programme 2014-2020, updates from European networks and regulators and articles on EU developments regarding health and professional regulation. On 7 April 2014 the European Commission published a consultation on introducing the European Professional Card (EPC) for nurses, doctors, pharmacists, physiotherapists, engineers, mountain guides & real estate agents. The objective of the consultation is to seek further views and to collect data on issues including the mobility of professionals, applications procedures and fees. The Commission intends to use the responses to assess whether the EPC is appropriate for the professions concerned and what impact it will have on EU countries. The consultation is open until 2 June 2014. The consultation is available here. From 9-12 September, the GMC is hosting the International Association of Medical Regulatory Authorities (IAMRA) conference in London. The theme of the conference is 'Medical Regulation - Evaluating risk and reducing harm to patients’ and more than 350 regulators, academics and health officials from around the world are expected to attend to share ideas and foster best practice in medical regulation. To take advantage of discounted early registration rates, make sure you register by 18 July. In addition, the conference also includes a varied social programme, which features a visit to the GMC in Manchester as well as a visit to visit to the Health and Care Professions Council (HCPC) on Monday 8 September. Visit the IAMRA 2014 website for more details. A conference-debate entitled "Organ harvesting in China: Europe must act now" is organised on the initiative of several international organisations at the European Economic and Social Committee on Wednesday, 19 March 2014 from 10 am to 12.30 pm. The press release of the European Economic and Social Committee is available here. Dr. Valentin SOJAR, representative of the Medical Chamber of Slovenia, will attend on behalf of the CEOM a Forum on Junior Doctors working conditions organised in Ljubljana on 15 March 2014 on the initiative of Slovenian and European Junior Doctors. At this occasion, he will make a presentation on doctors' migration in Europe. The European Network of Medical Competent Authorities (ENMCA) just published an analysis of all the replies to a questionnaire sent in December 2013 to the competent authorities of the ENMCA concerning the process of implementation of the European Professional Card. In order to access to this analysis and summary of findings, please click here. The purpose of the CEOM is to promote within the European Union and the European Free Trade Association the practice of high quality medicine respectful of patients’ needs.